»»» 3 new Light types under Light Tab menu. »»» Research is no longer need and now all 3 Lights set into "Light-Tab". - heater:eggs can hatch near to the lights. 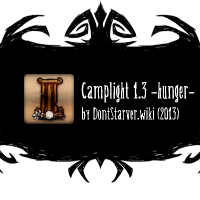 » Run: Don't Starve & Enable "CampLight 1.34 -giants-" under "Mods" menu. "05.19.2014" » update - 1.34 - "REIGN OF GIANTS UPDATE"
"02.01.2014" » release - 1.33 - "ALL'S WELL THAT MAXWELL UPDATE"
"11.07.2013" » update - "ALL'S WELL THAT MAXWELL UPDATE"
"10.13.2013" » update - "SIX FEET UNDER UPDATE"
"09.15.2013" » fixed - "issue with modicon"
"09.13.2013" » update - "A MODERATELY FRIENDLY UPDATE"
"08.22.2013" » update - "THE STUFF OF NIGHTMARES"
"08.19.2013" » update - "HUNGRY FOR YOUR HUNGER"
Anyway I have a question.Where can I find Lithtbulb please? in caves from light flowers or slurper. -- camplight --------------------------------------------------------------------STRINGS.NAMES.CAMPLIGHT_FLOWERS 											= "Lampadaire(Fleurs)"STRINGS.RECIPE_DESC.CAMPLIGHT_FLOWERS 									= "Un lampadaire avec des fleurs..."STRINGS.CHARACTERS.GENERIC.DESCRIBE.CAMPLIGHT_FLOWERS 			= "Un lampadaire avec des fleurs..."STRINGS.NAMES.CAMPLIGHT_EVILFLOWERS 										= "Lampadaire(Fleurs du mal)"STRINGS.RECIPE_DESC.CAMPLIGHT_EVILFLOWERS 							= "Un lampadaire avec des fleurs du mal..."STRINGS.CHARACTERS.GENERIC.DESCRIBE.CAMPLIGHT_EVILFLOWERS 	= "Un lampadaire avec des fleurs du mal..."STRINGS.NAMES.CAMPLIGHT_BULBS 												= "Lampadaire(Globe Luminescent)"STRINGS.RECIPE_DESC.CAMPLIGHT_BULBS 										= "Joli lampadaire avec des globes luminescents..."STRINGS.CHARACTERS.GENERIC.DESCRIBE.CAMPLIGHT_BULBS 				= "Joli lampadaire avec des globes luminescents..."
Btw, I upgrade the French traduction. It's a nice job. I like how bulbs surround the pillar (where do yellow ones come from?). -- camplight --------------------------------------------------------------------	STRINGS.NAMES.CAMPLIGHT_FLOWERS 											= "Lampadaire\n(Fleurs)"	STRINGS.RECIPE_DESC.CAMPLIGHT_FLOWERS 									= "Un lampadaire auréolé de jolies fleurs..."	STRINGS.CHARACTERS.GENERIC.DESCRIBE.CAMPLIGHT_FLOWERS 			= "Un lampadaire auréolé de jolies fleurs..."	STRINGS.NAMES.CAMPLIGHT_EVILFLOWERS 										= "Lampadaire\n(Fleurs du mal)"	STRINGS.RECIPE_DESC.CAMPLIGHT_EVILFLOWERS 							= "Un lampadaire auréolé de fleurs du mal..."	STRINGS.CHARACTERS.GENERIC.DESCRIBE.CAMPLIGHT_EVILFLOWERS 	= "Un lampadaire auréolé de fleurs du mal..."	STRINGS.NAMES.CAMPLIGHT_BULBS 												= "Lampadaire\n(Globes luminescents)"	STRINGS.RECIPE_DESC.CAMPLIGHT_BULBS 										= "Joli lampadaire auréolé de globes luminescents..."	STRINGS.CHARACTERS.GENERIC.DESCRIBE.CAMPLIGHT_BULBS 				= "Joli lampadaire auréolé de globes luminescents..."
i will check it now. i don't have this problem. I think there may be a bug where after you have crafted the camplight(flowers) you do not get the preview image of it when you want to place it down, you still can place it but its a bit of a guess where it might be. thank you! I'll check it when I feel better. currently I'm a little sick. Still not showing under recipe tab with a modded character. I have tried many "tunings", in modmain but no results any idea? and post your log.txt here. I like this mod and etc. but still not works for me...tried with some mods and standalone and no effect to the game.And nope,my DS version is really clear & original. run your game only with camplight mod, start a new game/world then exit your game and share me your log.txt please otherwise i cant help. same attention goes to all other people with problems. Just in case of, I tried to put them under light tab, not better! As you suggested here is a log.txt with only camplights 1.3 and the character "wicked"
scripts/mods.lua(173,1) Mod: CampLight 1.3 -maxwell- (Camplight 1.3) Mod had no modworldgenmain.lua. Skipping. scripts/mods.lua(173,1) Mod: characterwicked (*Perso* Wicked) Mod had no modworldgenmain.lua. Skipping. ../mods/characterwicked/images/saveslot_portraits/wik.tex is 120x104 but compressed textures must have power of 2 dimensions. ../mods/characterwicked/images/selectscreen_portraits/wik.tex is 188x284 but compressed textures must have power of 2 dimensions. ../mods/characterwicked/bigportraits/wik.tex is 560x720 but compressed textures must have power of 2 dimensions. C:/PROGRA~2/DONTST~1/data/scripts/mods.lua(173,1) Mod: CampLight 1.3 -maxwell- (Camplight 1.3) Mod had no modworldgenmain.lua. Skipping. C:/PROGRA~2/DONTST~1/data/scripts/mods.lua(173,1) Mod: characterwicked (*Perso* Wicked) Mod had no modworldgenmain.lua. Skipping. C:/PROGRA~2/DONTST~1/data/scripts/map/forest_map.lua(613,1) Done forest map gen! 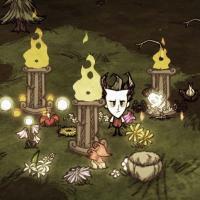 please try DebugSpawn("prefabx") and check all 3 camplights "camplight_bulbs","camplight_evilflowers","camplight_flowers". normaly it should work. log.txt shows just some errors by your wicked character. Yes it works with debugspawn, it was one of my first checks. The prefabs are in game and works perfectly... if I spawn them with the command! I noticed that your trashbin mod is identical (nearly), and guess what? this one works with modded char!!! So I also tried to take it as a base, and just tune it to a "single camplight mod"... NO WAY! The modded chars don't like this mod! Does it for all or am I the only one in this case? some files of your custom character are not correct. tell me where your problem is, log.txt to otherwise i cant help you or other ppl. and about the mod she works for me and since i uploaded it none told me there is a problem.